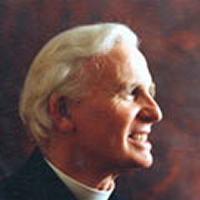 The Reverend Father Joseph Mary Gill, S.J., was the Director of the Sodality of the Blessed Virgin Mary and Saint Patrick from 1975 until his death in 2006. Born in County Mayo in 1915, he was a student of the Servant of God Father John Sullivan, S.J., at Clongowes Wood College in County Kildare. He entered the Society of Jesus in 1934 and was an outstanding Jesuit for the remaining 72 years of his life. He was ordained a Priest on the Feast of St. Ignatius, 1945. Having taken his final vows in the Society earlier that year, he became one of the 'founding fathers' of the Irish Province's mission to the then Northern Rhodesia, now Zambia. He was justly proud of his time as Administrator of St. Ignatius' Church, Lusaka, and Canisius College, Chicuni. In 1958, Fr. Gill came back to the Church of St. Francis Xavier, Upper Gardiner Street, Dublin 1, which was to be the home of his apostolic zeal for almost half a century to come. Fr. Gill was revered by countless souls not only for his personal holiness, which shone forth in an unassuming and manly way through his devotion to the Holy Sacrifice of the Mass and to Our Eucharistic Lord, and to his immence filial love for Our Blessed Lady, and also to through hour after hour, day after day, spent in the confessional 'on the corridor' in Gardiner Street, as well as his constant availability to penitents outside the confessional, but those legions of souls revered him for his personal qualities of kindness, decency, fearlessness, prudence and generosity to the poor and any soul who met him, summed up in his own words: "Say your prayers, do your work and be kind to others."